Adam Chatfield was a hard working flanker from the ACT Rams (originally from Pennant Hills in New South Wales), taken with Pick 23 in the 1997 National Draft. Chatfield, who played with a mop of long blonde hair and had a sharp, pointy nose, had a fine, long if not airey kick on both sides of the body, but unfortunately struggled to crack it into the Carlton team. 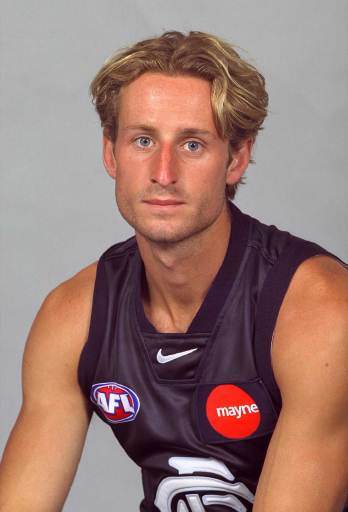 Chatfield was on Carlton's list for 4 seasons from 1998-2001 and while he managed to play a solitary game for Carlton in Round 19, 2000, he was never actually named in Carlton's senior team- gaining a last minute call up when named as an emergency, after 2 players were late withdrawals. After just 8 possessions and with the return of senior players the next week, he failed to be selected a second time. He spent the whole of 1998 in the reserves, while in 1999 was troubled by a series of injuries to his scaphoid, ankle and jaw. 2000 and 2001 were spent in the VFL in all but his one senior call up. He went on to have a year or two on the Geelong rookie list, this included Chatfield playing in Geelong's VFL premiership team in 2002. Chatfield headed to Old Xaverians in 2003 and represented the VAFA in the same year. Contributors to this page: Bombasheldon , molsey , tmd1 , BlueWorld , true_blue24 , Jarusa and admin . Page last modified on Sunday 02 of June, 2013 12:46:32 AEST by Bombasheldon. 1987 Reserves GF Match Review.